The Tanglewood Marionettes entertained an audience of over 200 at the Littleton Lyceum's second program of their 2011-12 season. 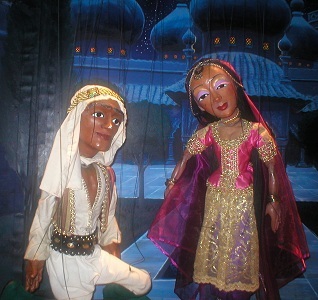 A nationally touring puppet theater, the Tanglewood Marionettes was founded in 1993 by Anne Ware and Peter Schaefer and is currently based in central Massachusetts. On Friday, Dec 9, they presented their original show, "An Arabian Adventure," based on the stories of "1001 Arabian Nights." While the plot was fun and fast-paced, it was the beauty and professionalism of the show that made it a big hit with the audience. After an introduction to puppetry by Peter Schaefer, the show begins with the house lights lowering as the puppet theater opens, book-like, and the compelling music draws the viewer into the story. Each page of the "book" is a glorious backdrop before which the very human-like marionettes perform. An adventurous prince finds a grieving princess -- the prisoner of her evil uncle, the vizier. We go from a splendid palace garden to a dismal dungeon to caverns and secret passages and finally into the sumptuous palace itself. All along the way we are introduced to marvelous characters: the scheming vizier with glowing eyes, a helpful ghost hovering over a malevolent skeleton, a heroic flock of bats, a truly scary monster scorpion and more! As the book closes and we reach "The End," we feel we have been a part of an amazing bit of storytelling. 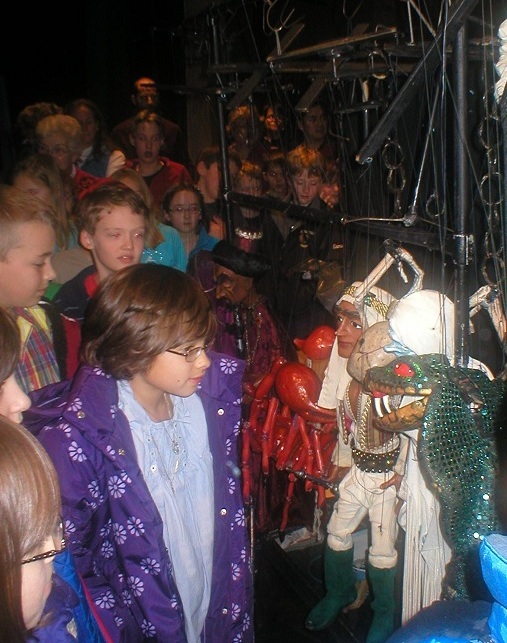 The mixed-generational audience was enthralled at every turn, especially, when in his adventures, the puppet Prince made his way down into the hall and tramped through, around and over attendees. Children followed along as though he were a pied piper. Our persevering prince ultimately managed to defeat the nefarious vizier and win the heart and hand of his princess. After the show, most of the theater-goers elected to stay and explore backstage. Peter Schaefer demonstrated how many of the special effects worked -- the disintegrating skeleton, the evil, glowing eyes, et cetera -- while Anne Ware introduced several score people to the various puppet performers. It was an enchanting and delightful evening. The program was co-sponsored by the Rotary Club of Littleton, whose president, Alan Bell, spoke. He reminded us of the many civic projects supported by Rotary, such as the donation of dictionaries to each third grader, co-sponsoring the 4th of July Town Picnic and the ever-popular Appleman Triathlon. The Littleton Lyceum's next program will feature renowned author Michael Tougias presenting "Fatal Forecast: An Incredible True Tale of Disaster and Survival at Sea." This will take place on Friday, Jan. 27 at 7:30 at the performing arts center at Littleton High School.